When my parents surprised me with some extra cash on my birthday, I knew exactly what I wanted to buy. I had been drooling over fitness monitors forever. Every time I watched one of those fitness shows like Biggest Loser, I was always curious about the monitors they wore, but figured I’d never be able to justify spending that kind of money on myself any time soon. YAY birthday present money! (I feel like I’m 10 again). So once I made the decision to hop on this hi-tech health wagon, I began researching which type of monitor I wanted. I’m not going to lie…it was pretty difficult deciphering the differences. The Biggest Loser one, BodyFit Media, seemed like the obvious choice given how much I love that show— but upon looking into it more, I really didn’t want to have something high up on my arm all day. Plus there was a membership fee. Eh…not my style. So then I left it to Googling and saw the great debate between the JawBone UP and FitBit Flex– both wristband fitness monitor systems. The JawBone seemed pretty awesome, honestly, but when I found out it didn’t have syncing capabilities (ie. I’d have to plug it into my computer at the end of everyday) I figured I’d be too busy to remember that step at the end of every single day before bed. So I decided to get the FitBit Flex because of it’s super awesome capabilities and the fact that it would sync with my phone/computer….until I realized they were out of stock EVERYWHERE and on back order. I was so pumped for this, the thought of waiting TWO MONTHS for my birthday present seemed terrible. So, I decided to research some more to figure out if that is 100 percent what I wanted and if it was worth waiting for. That’s when I discovered the FitBit One, made by the same company as the FitBit Flex. But, instead of being a wristband, it’s a clip like a pedometer. However, this clip is much more snazzy and can even be concealed underneath my clothes attached to my bra. Honestly, that sounded even better than a wristband. It would be so discreet, even on fancy occasions. So, I looked at their product comparisons. Yup…the FitBit One only lacked two things: not able to be worn in the shower (I think I’d live) and goal setting (I’m pretty sure I can set my own goals without a wristband). PLUS it had a screen on the little device that would read me my stats if I wanted, unlike the wristband. I thought that was pretty cool. So, I decided to give it a go, and I got my piece of awesome on Monday. I am so in love with this little gadget. It’s basically a super pedometer that has gotten me so excited and aware about my everyday movements. It syncs to my phone when I’m near the “doggle” which I keep plugged into my home computer. But if I ever want to check my progress during the day, the screen will light up with my steps taken, distance gone, floors climbed, calories burned, and even a “progress flower” that will grow if you keep your activity levels up. I’ve already become more aware and it almost feels like a game to me. When you log on to the phone app (or your online profile), it automatically says your goal is 10,000 steps. Initially, that seemed like a LOT to me. How can I do that when I work in an office? I barely made 5,000 the first day, and I did try to take the longer routes to places and get up a couple of times during work to stretch my legs. The next day I surpassed 5,000 but still didn’t get anywhere close to 10,000. But yesterday, I was so pumped. I had some down time during my lunch break so I took an opportunity to call my mom and walk around the entire office campus. When I got back, I found out just in that 30 minute span, I had walked well over 2,000 steps. Oh and the biggest perk? Because I live in a very mountainous region full of hills and natural inclines, it also claimed that I walked 17 flights of stairs already by noon. Given, a few of those were real stairs (I’m currently working on the third floor of a building), but I had definitely not taken that many literal flights. Glad that hilly lunch walk gave me some added benefits. By the end of the day though, after taking over 11,000 steps and walking 5 miles, my tracker said I walked the equivalent of 42 stairs. AND it tracks my sleep. 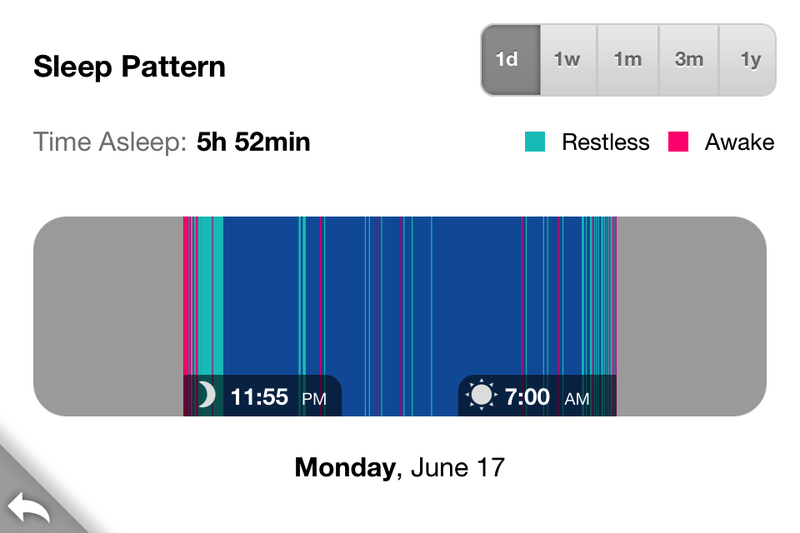 I put my FitBit One in a soft armband, and at night, it’ll track my movements to gauge how restless I am in my sleep. Yeah…I’ve been a terrible sleeper lately (and I need more sleep). But since getting this, I’ve already slept longer than this first night because, I’m not going to lie, seeing how little sleep I’ve gotten kind of made it more real for me. I’ve always known I needed to sleep more. Now, I have a colorful chart to encourage me not to deprive myself. AND as if things couldn’t get any better, not only does the app sync to my already beloved MyFitnessPal app, it also awards me badges on my progress. I LOVE feeling like I accomplished something. Its only the first week, but I’m pretty sure me and my new buddy, the FitBit One, are off to a good start. Having a mini motivator at my disposal may have been just what I needed in the fitness department. It is now November 2014 I would like to know if you are you still using your fitbit and why or why not. Did it really help you to lose any weight?